This is the view for the first mile. Up hill !!! 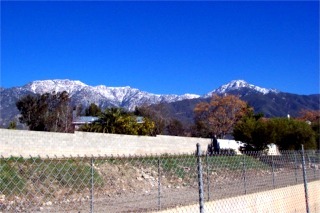 It is unusually pretty this time of year when the mountains have snow on them. 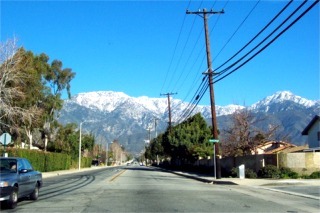 I run on the sidewalk on this stretch. 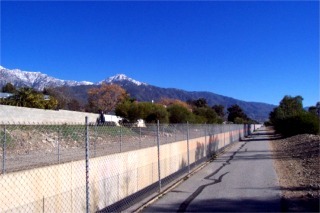 This is the Cucamonga Creek trail. Rivers here in California are made of concrete<grin>. This stretch is about 2/3 mile. On weekends I usually wait till about 8:30 so the sun is stronger. The temperature will be in the 40's but the sun is hot so I run in shorts and a T-shirt. 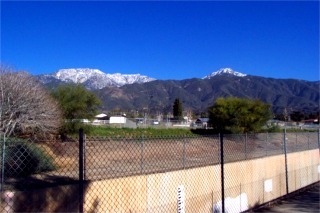 This is the same view as above but looking more towards the mountains then the trail. 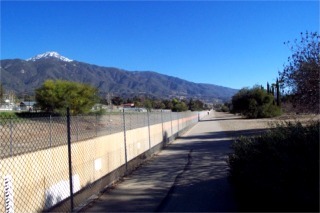 This is the next stretch of the trail and goes about another 2/3 mile. When I reach the end I run on the streets. Up here there is not much traffic. The run out is all up hill until I turn around. This stretch has horses, roosters, goats chickens and who knows what else. Plenty of noises in the morning. On the other side of the creek it is not paved and is meant for the horses. There are a lot of trails here for them to go up into the mountains.